HOUSTON -- Wal-Mart's court fight to sell liquor at its stores in Texas looks to be back on track, but the courtroom is getting crowded. A federal appeals court is allowing a trade group representing liquor store operators to join a stalled federal lawsuit that the nation's largest retailer filed against the Texas agency that hands out permits to sell booze by the bottle. In trying to crack Texas' restrictions on package liquor licenses, some dating to the end of Prohibition, Wal-Mart contends that some of the Texas Alcoholic Beverage Commission's rules amount to unconstitutional discrimination. Austin-based U.S. District Judge Robert Pitman had set the suit for trial next month, but everything stopped in May when the Texas Package Stores Association, representing about 2,500 existing liquor store retailers, got a green light from an appeals court to move forward with challenging Pitman's refusal to let them intervene on the side of the beverage commission. A panel of the 5th U.S. Circuit Court of Appeals overturned Pitman's ruling last week and let the association join the lawsuit, saying the trade group had a "protectable interest that may be impaired or injured" in the outcome. Pitman now must set a new trial date. "On behalf of our Texas customers, we are prepared to pursue the case to provide Texans their freedom of choice," Wal-Mart spokeswoman Anne Hatfield said. Booze is popular in Texas: The liquor industry in Texas generated nearly $14 billion in sales in 2014, the latest annual numbers available from the state Comptroller's Office. And Wal-Mart, with its 574 stores, markets and Sam's Club outlets in Texas, says it's the state's largest purveyor of beer and wine. While the Bentonville, Arkansas-based company sells liquor in 31 states, it's resorted to court actions only in Texas to try to get into a state's liquor market. In its February 2015 lawsuit, Wal-Mart touted it "helps people save money and live better by purchasing quality products at competitive prices." But the Texas Package Stores Association contends the retailing giant wants to "upset the level playing field" and "change the structure of the Texas market" that's existed for decades so the company can make "mass sales of low-priced liquor." The store group contends the initial defendant, the Texas Alcoholic Beverage Commission, was focused on more general issues regulating the alcoholic beverage industry in the state and not specifically on liquor store dealers who "stand to lose substantial revenues and long-term investments and be placed at a competitive disadvantage." TABC spokesman Chris Porter said he couldn't comment on pending court matters. Bills to loosen liquor license restrictions were introduced in the Texas Legislature in the last session in 2015 but never got out of committee. One such rule that mandates that a publicly traded company - like Wal-Mart - can't hold separate beer and wine and liquor licenses; Hatfield said the rule "is counter to Texas' belief in free enterprise and fair competition." Another idiosyncrasy allows publicly traded hotel corporations to sell both beer and wine and liquor by the bottle, which Wal-Mart said in its lawsuit is "nothing more than naked economic protectionism." 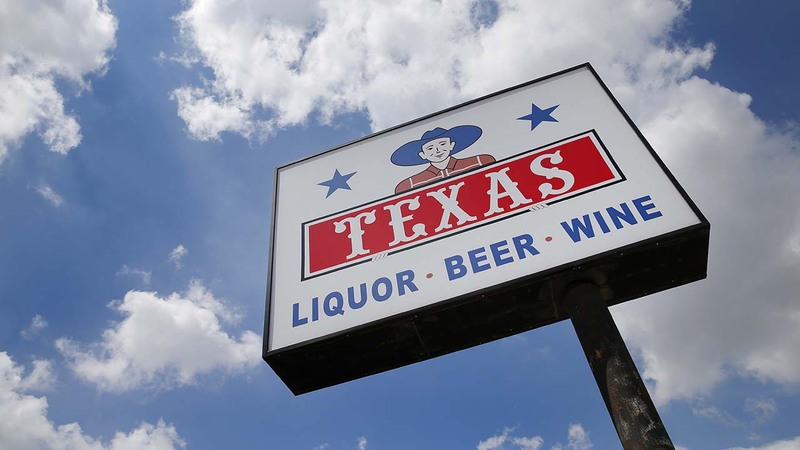 A Texas liquor license holder also is limited to no more than five package stores, though an immediate blood relative can acquire other licenses and consolidate those licenses into a single entity that exceeds the five-store limit. The effect of that rule is growth of family-owned chain liquor stores in the state; Wal-Mart complains it has "no blood relative" to take advantage of the provision. The five-store limit and the prohibition on holding both a package store permit and a beer and wine retailer's permit go back to 1935, when the Texas Liquor Control Board was created after Prohibition ended. Lawmakers revised its duties and renamed the panel in 1970, and legislators added the publicly traded company ban in 1995 to blunt the effect of a court ruling that invalidated a provision requiring a license holder to be a resident of Texas for at least a year. One restriction not being contested is a ban on liquor sales at grocery stores. A separate building with its own entrance is permitted under the law, and Wal-Mart says it would accommodate that by dedicating a distinct piece of property at stores to the liquor operation.